Twelve-year-old Miriam and her seven-year-old brother David are orphans. They live with their grandparents in Sosnowiec, Poland during the Great Depression in 1937. When the grandparents can no longer take care of them, they make the heartrending decision to place David in a Jewish orphanage and pull Miriam out of school to work in a butcher shop. But Miriam is determined to rescue her brother and bring him home. This story is heartbreaking to read, especially knowing that it is based on true events that happened to the author’s own cousins. As a mother, my heart ached for Miriam and David, so young and taken advantage of by cruel and greedy men. My sensitive daughter was sad because of the children’s desperate situation and my son kept saying, “Mommy, those are bad men”, in reference to the orphanage director and the factory owner who forced David to work in a factory. He, too, keenly felt the injustice. 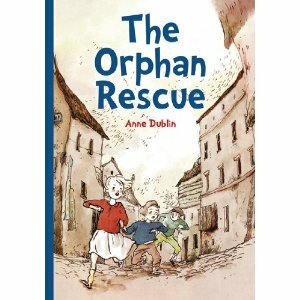 The second half of the story is adventurous as Miriam teams up with Ben, another orphan, to rescue her brother. Miriam and David’s close relationship is beautiful and it is touching to see what Miriam is willing to do to help her brother and her family. My daughter was very happy that it ended on a hopeful note. This book is a real eye-opener for children. Although sad, it shows the resilience of the human spirit and celebrates the courage and determination of filial love. Sounds like a great story. I'm glad to see it ends on a hopeful note too. This sounds like a great book and one that I would enjoy reading to my son. Thanks!